The CS505-LC was retired on September 22, 2009. 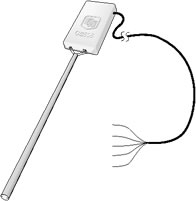 The cable on this version of the CS505 Fuel Moisture Sensor has a connector that attaches to the MetData1 Weather Station. The CS505-LC consists of an epoxy-encapsulated electronics package. It uses Time Domain Reflectometry Technology to measure the moisture content of the 10824 10-hour Fuel Moisture Stick. The 10824 is a USFS-specified, 10-hour, ponderosa-pine dowel that is purchased as a Common Accessory (see Ordering Info).